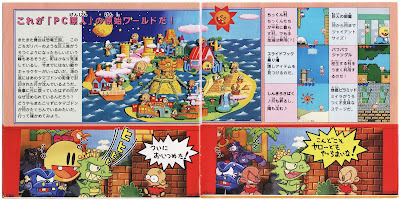 Despite my undying love of the first PC Genjin (Bonk's Adventure to all of you TurboGrafx-16 fans) and the second (aka Bonk's Revenge), my heart's never skipped a beat for the series' third release, known in Japan as PC Genjin 3 and in North America as Bonk 3: Bonk's Big Adventure. 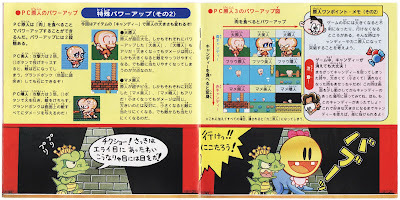 The main reason I've long given this Red Company-made platformer the cold shoulder: In current verbiage, it's because PC Genjin 3 feels a little to much like an "expansion pack" for PC Genjin 2. 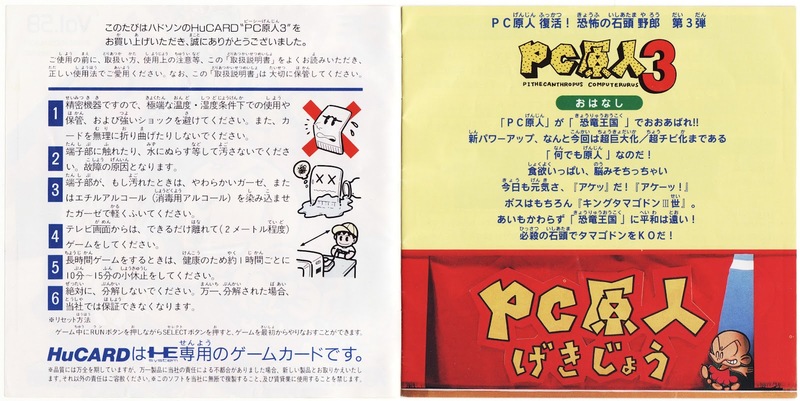 PC Genjin 3 tries to differentiate itself from its predecessors in at least one area, thankfully: Its instruction manual (the cover of which can be seen in the scan below). How so? 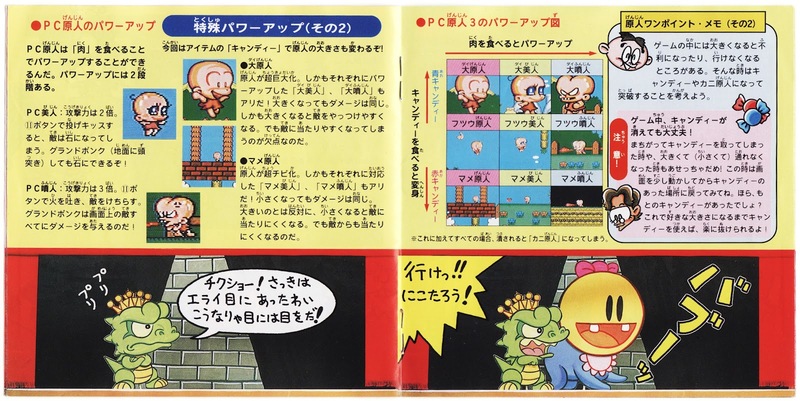 Well, for starters, PC Genjin 3's manual is about twice as long as PC Genjin 2's. 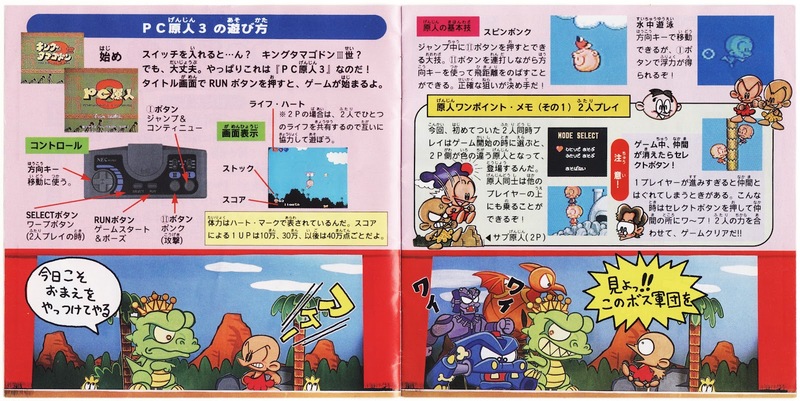 Also, PC Genjin 3's manual features a comic that runs across the bottom of pretty much every page. Because I don't understand a word of Japanese, I can't say if it's a good comic or not. 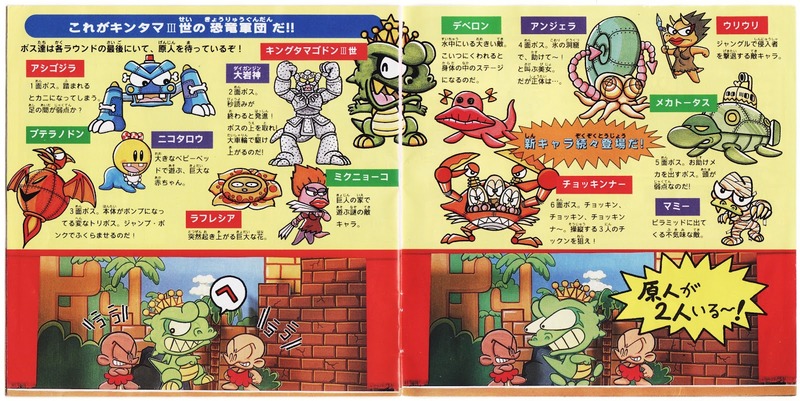 Regardless, it features a number of nice drawings, so at least there's that. 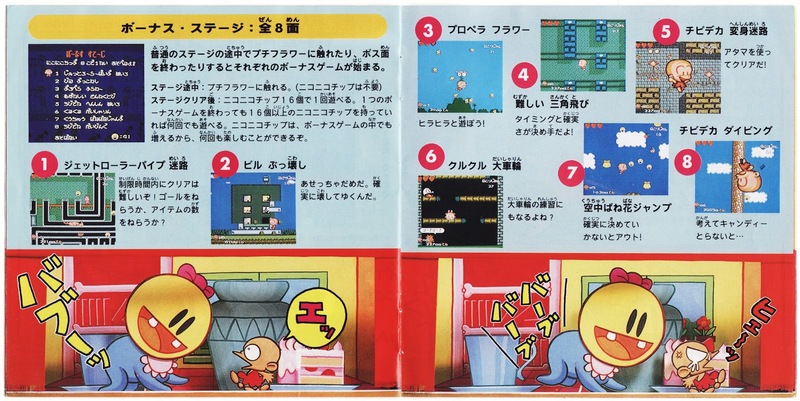 The rest of this manual's many pages, though, are filled with your usual assortment of instructions ("here's what the I and II buttons do," "here's what happens when you eat a giant hunk of meat," etc.) 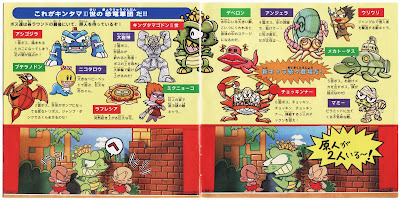 and illustrations. 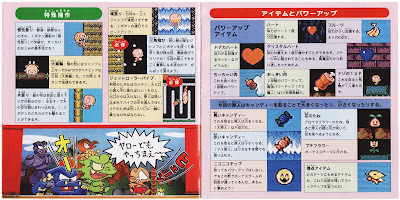 The illustration above--with the titular caveman trying to catch a flying King Drool (is that his name in Japanese? I kind of doubt it...) with what looks like a bug net--is my favorite, by the way. Another random note from yours truly: I love that in PC Genjin 2 and 3, the protagonist dons cavewoman drag--see the screenshots above--after downing a second piece of meat (the main power-up in this whackadoodle platforming series). 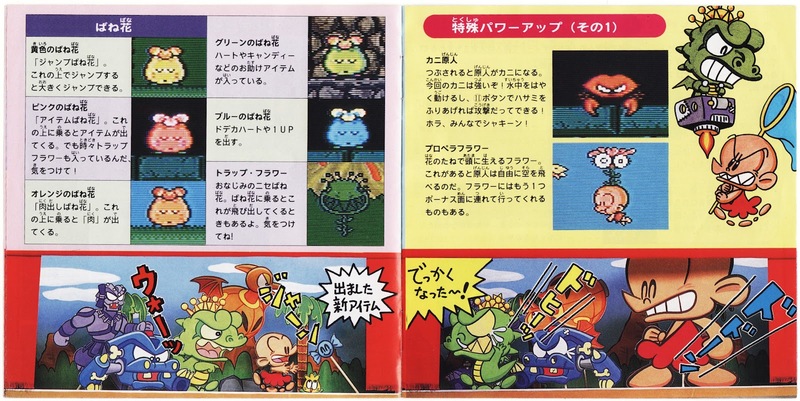 If you've been paying attention to these "Manual Stimulation" posts for any length of time, you should be well aware that I love it when an instruction booklet includes illustrated depictions of a game's baddies. 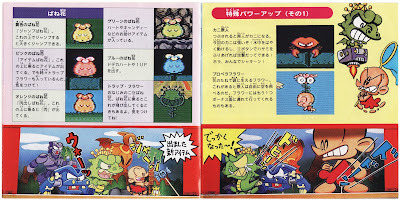 PC Genjin 3's doesn't disappoint, thankfully, with (the majority of) three pages devoted to such devilish drawings. So, does all of the above mean that PC Genjin 3's instruction manual is better than the ones produced for its predecessors? Sadly, no--at least, not in my opinion. Don't get me wrong: It's far from a terrible manual, but it's also far from a great one. Oh, well, at least it sports a pretty colorful cover. Also, PC Genjin is the best videogame pun ever. 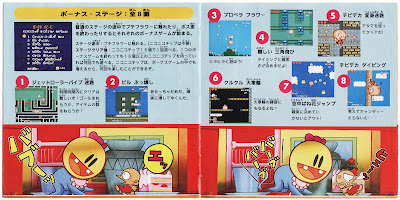 I think I like this manual the best of the three. That said, I don't think I ever played this one. Justin: Interesting! 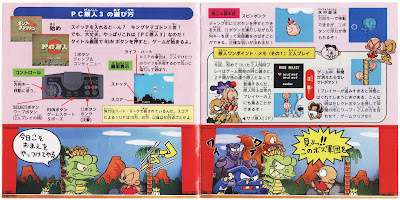 Why do you say that (that 3's manual is the best of the bunch), if you don't mind me asking? As for having not played this one: Well, I'm sure you're not alone. The overall word of mouth on it is pretty bad, for starters. 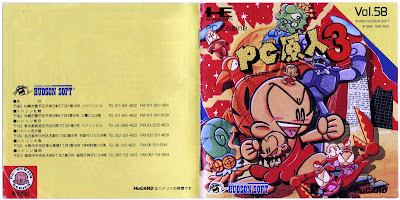 Plus, if I'm remembering correctly, it came out fairly late in the PCE's/TG-16's life. As such, it probably was easy to overlook. I know I overlooked it for many years, and I was a die-hard TG-16 fan! I just think it has the best illustrations and the most interesting layout. Sounds good to me, Justin! I, too, like the illustrations that appear in this one quite a bit.